Q: How difficult would it be for someone that is pretty handy with a socket set to build a bike? How difficult would it be to find high-end parts to fit a vintage frame? A: Bike assembly is not too difficult for anyone who's mechanically-inclined. There are some special tools that make things easier. Being careful with the torque settings so parts aren't stripped is essential. It might be best if the bottom bracket, crank set, and headset were installed by someone with experience. 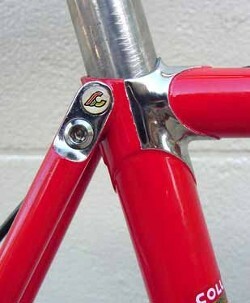 Other than that, bikes of an older vintage without braze-ons, require clamp-on cable guides, which are still widely available. Getting the cabling just right and setting up brakes requires a bit of tinkering. There's plenty of guidance online for that. 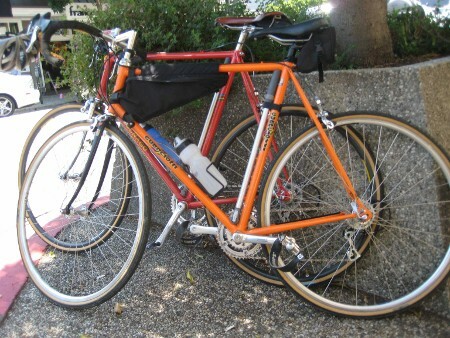 Both older and new components may be mounted on vintage frames. Finding parts isn't a problem, either period-correct or newer. You just have to know the frame dimensions to get the correct size pieces, like bottom bracket spindle length and front derailleur clamp size. 28.6mm is typical but not universal. Seat post diameter differs depending on the frame tubing used. 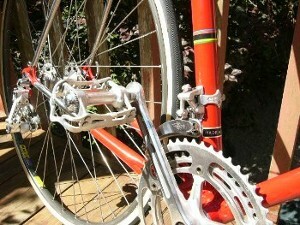 Many vintage Italian racing frames use a braze-on front derailleur hanger. This can somewhat limit using a smaller outer chain ring, since they were usually designed for larger, racing outer rings of 52 teeth or more and the front derailleur may not shift quite as well with very much smaller outer chain rings. Vintage frames can also have their rear stays "cold-set" from 126mm (6/7-speeds) to 130mm to accommodate 8-, 9- 10- and 11-speed rear hubs. Some people frown on this. However, it's been widely done for decades. Suggest it should only be done by an experienced mechanic who's familiar with steel frames and has the tools to correctly align the stays and drop-outs. It's not just a matter of yanking the stays apart until the hub fits. Repeated stay dimension changes should not be done to a frame. Q: Can this frame-set take a modern component group? A: The short answer is yes, it can. Some later components will certainly work, but not all. Seat post and front derailleur clamp diameters differ among various bike models and designs regardless of the year made. Also, vintage steel bikes like I sell are designed for a quill stem, not a threadless, ahead-set type, which most modern bikes now use. There is a workaround quill adapter that can be used to fit a thread-less stem on a threaded, quill-type fork. Most bikes, including ones made in Asia — which is much of what's sold now — use an English-threaded bottom bracket, not Italian. Italian-threaded bottom brackets are widely available for newer style crank-sets however. Additionally, it is very unlikely an entire component group that's been removed from a late model aluminum or carbon fiber frame to swap over to a vintage steel frame or even another modern one. There are few bike component standards anymore. Wheels, brake calipers and levers, shifters, and derailleurs will usually work, but there will be some pieces that won't. I strongly recommend getting your frame and then purchasing the parts needed rather than the other way around. Otherwise, you will have some components that do not fit. This would be true even if someone were assembling a newer bike. Q: Your listing described it as SL and the Columbus label indicates the same. I prefer SL tubing because I'm not interested in a stiffer ride. 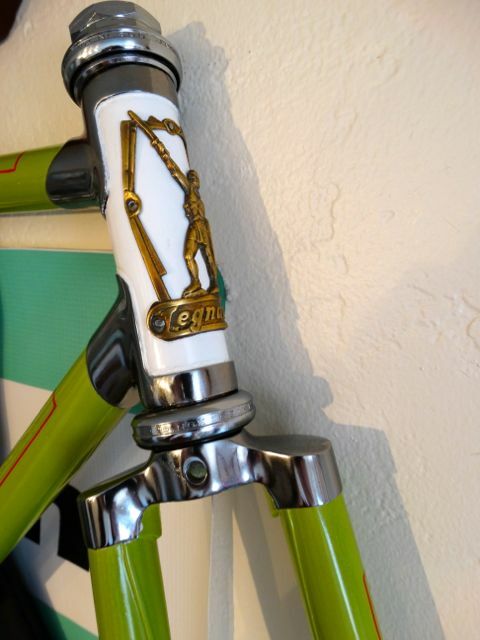 A: The Bartali had no tubing sticker when I got it. It was a fair assumption that it's made of Columbus SL since that was the material of choice by nearly all builders of that era for their premium models and I don't typically measure seat tube diameters on the frames I restore. The SP (or whatever) tube set will not cause the bike to have a "stiffer" ride. They used slightly thicker butted tubes in taller frames to maintain the same ride feel as smaller ones and for durability. Frame angles, wheels and tires are more important contributors to the ride-feel anyway. The stuff about people being able to tell the difference between frames made of differing Columbus tubes is just that — stuff. This is not my opinion, but from several master frame-makers I've discussed it with. There's a lot of voodoo among cyclists about equipment. Q: My wife is tall (6 feet) with a short torso. I am looking for a 62cm seat tube and 54-55cm seat tube frame/fork. Is this something you can help me with? 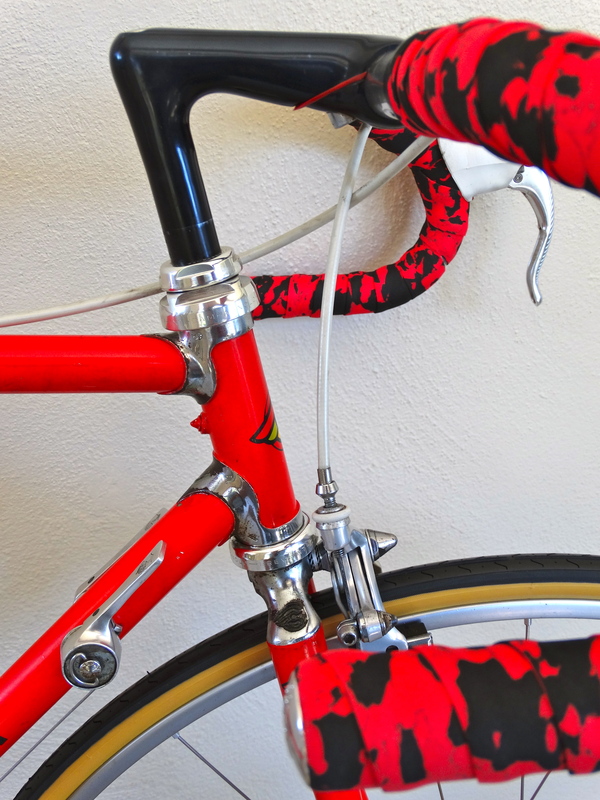 A: The seat-to-top-tube combination you're asking about is quite unusual. 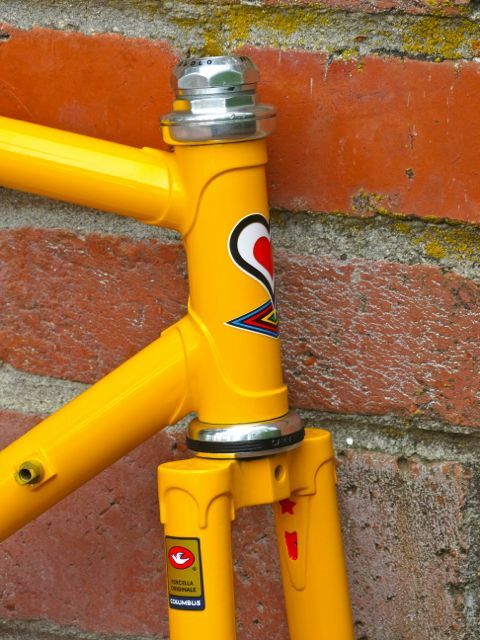 I've not seen a vintage, Italian stage race frame like that. Most 62cm frames would have a 58 - 60cm top tube. The frames you see listed are what I currently have. There is more coming, but nothing with the dimensions you mentioned. My suggestion is to fit her with a frame where the seat tube makes sense for her true inseam length and then use a shorter reach stem so she's not stretched too far out over the frame. Most originally-equipped Italian racing frames came with a 120 or 130mm stems, which are great for young, elite athletes but not for normal, recreational riders. The general frame size recommendations for riders of average proportions are below. My best advice is that she should try riding traditional dimension frames (not modern sloping top tube ones) and discover what works, including making appropriate stem and seat adjustments. Q: What does the term "nutted brake attachments" mean? Is there a special bolt length required for brakes on this frame? A: Prior to recessed or countersunk Allen-head brake nuts, as you see on frames from the '80s on, the attaching nut was exposed rather than recessed. The then-standard length brake center-bolt extended through the fork crown and rear brake bridge with an exposed hex nut. So when working on an older frame, the brake caliper center-bolt needs to be a bit longer than newer style calipers to fit. A workaround or update for front brakes is to simply drill a countersink in the fork crown for the recessed Allen head nut. For the rear, a newer front brake with a longer center-bolt can be used. It is also easy locating earlier style, nutted brake calipers if drilling a countersink in the fork is not preferred. Also, for the rear, if a frame is being refinished, it would be possible to have a later type brake bridge brazed in, which uses recessed bolts. That's a rather extreme, costly solution and one that wouldn't sit well with vintage bike enthusiasts preferring originality. When I built my early '70s ride with later era components, I did what's described above, counter-sunk the fork drilling and used a later style, front caliper with a long enough center-bolt in the rear. Everything works perfectly. Q: Would you ever sell a bike with a groupset and all the other components? 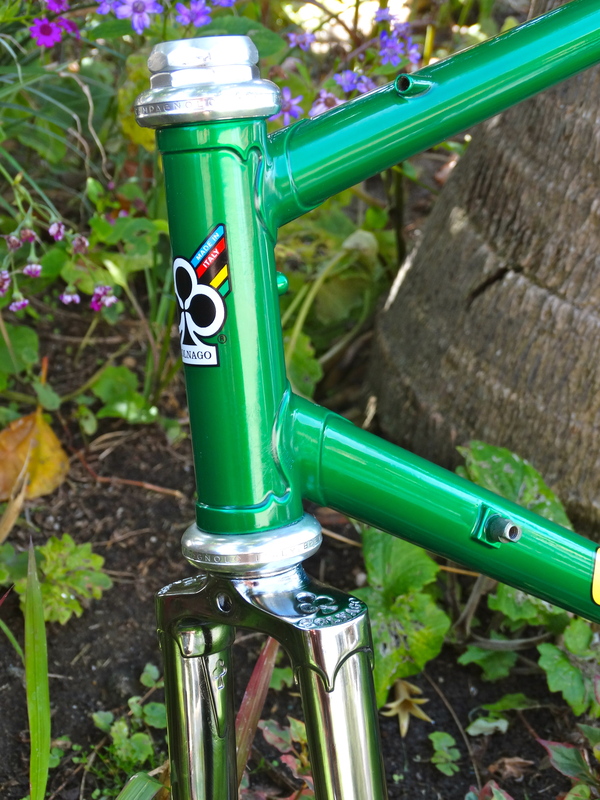 I usually ride a 58cm frame and love chrome lugs. I used to have a Superissimo that was a 56 and it was too small. I'd love this one, but I fear it's too tall. A: I stopped doing complete bikes because it's uneconomic, and people often want something changed, as well as the liability (especially in California) of selling bikes. I also get the most satisfaction from the restoration part. Building up a bike is far more time-consuming than many people realize. A nice, used vintage or modern component set can be found for a few hundred dollars depending on what quality is desired. 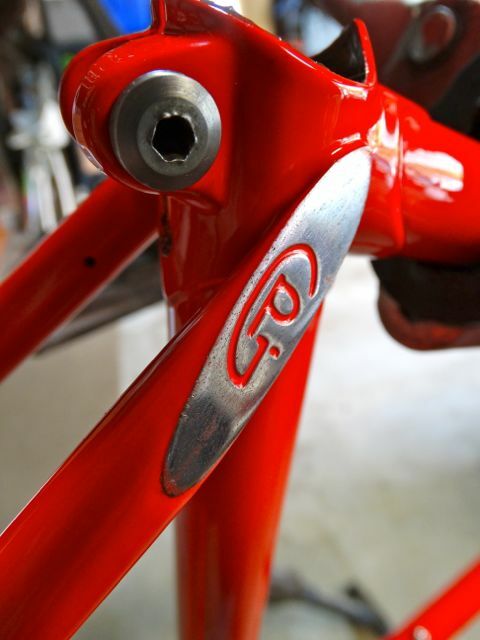 Modern components can easily be used on classic style Italian steel frames. 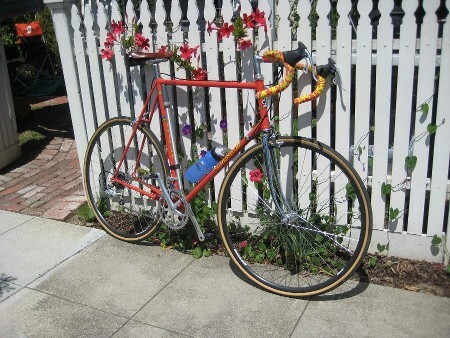 On your fit question, suggest riding some 59cm vintage-style bikes if it's super critical. I'd offer that many people ride too small a frame and that 1cm is a pretty small difference if a 58cm frame works for you. Seat posts are, after all, quite adjustable. Comfortable fit also has lot to do with the seat itself, seat position, and how long a stem you're using. The 120mm stems that typically came with most vintage bikes were meant to give the rider a stretched-out, "flat back" racing position. (They're racing bikes after all!) For recreational use, I suggest a somewhat shorter reach stem and perhaps also one with a longer quill. A slightly larger frame should allow you to get the bars equal in height to the seat. If there's a big difference between seat and bar height, (seat notably higher) you're going to have a lot of weight on your hands and your neck will be craned to see forward. This may work for a young, elite athlete, but not so well for a recreational rider who wants to ride farther than to the cafe or post office and back. Q: I am trying to determine what kind of ride to expect with the CIOCC. Is it a racing geometry or more sport like a Colnago Master Light? 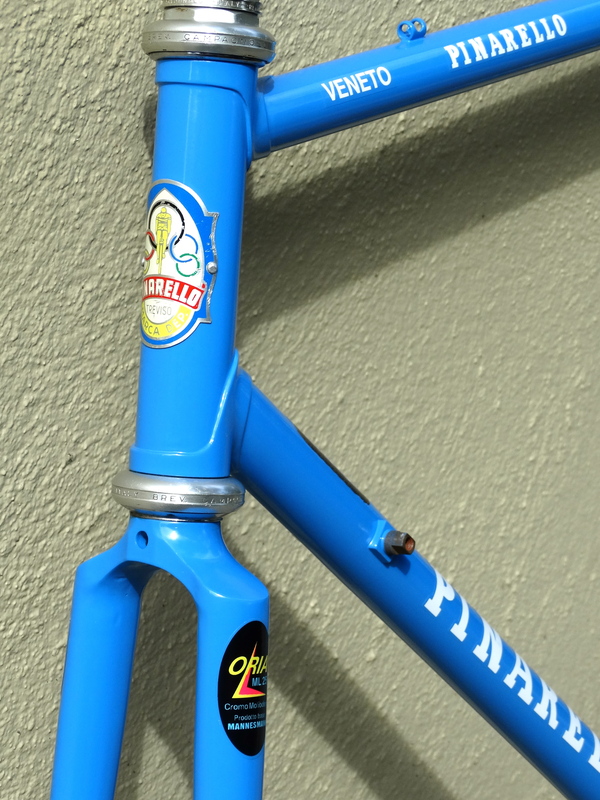 A: 1980s Italian stage race frames are notably more relaxed geometry than later (90's or current) racing frames which tend to be too stiff for recreational or distance riding. It may ride like a Colnago of the period. 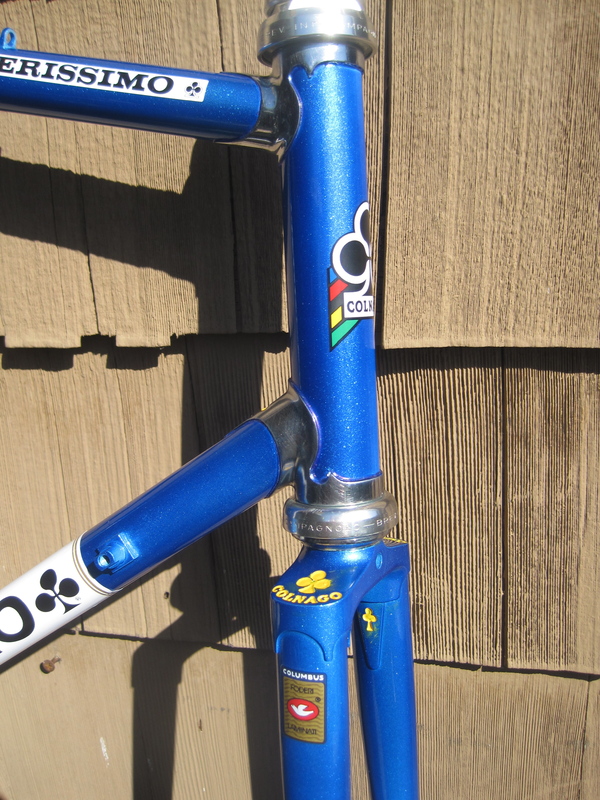 However, please remember, I obtain and restore these frames, I don't build them up and ride them, so there's no way I can know what it's riding characteristics may be, nor have I ridden a Colnago Master Light. All the Italian steel frames of this period that I've tried have been very enjoyable riding and handling. That said, wheels, tires and saddles also make a HUGE difference in ride, comfort and handling as well. The subjective question being asked is something I'm really unable to address. It would be like asking if the frame is going to fit you comfortably. This is something a buyer needs to understand and take responsibility for. Q. Would the Colnago Superissimo fall into the same category of a more relaxed geometry? A: What I've found to be true about frames of this period is they are very similar because all the artisans were copying each other and many were apprenticed or employed in each other's shops. The differences are in details and sometimes in build quality. However, I've found they all usually ride very nicely, which is, after all, most important. Guerciotti is a well-respected brand. My friend rides a 58cm Guerciotti and enjoys it very much. Yes. 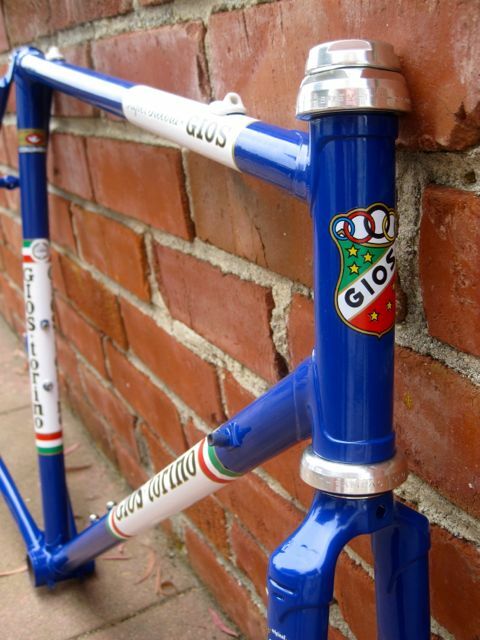 The Colnago Superissimo I have will likely ride very much like the Guerciotti. They have very similar frame angles and are made with the same materials. As mentioned, wheels and tires can strongly affect ride as well. Rider position on the frame as determined by seat, bar, and stem settings, also make a significant difference and many people are set up on their bike incorrectly. Any look at a group of riders clearly demonstrates that. However, people will accommodate an incorrect and uncomfortable fit unless or until they have an opportunity to ride a bike that in fact fits them correctly. Q: What would you reckon the stand over height is? I'm 176cm (5'7") in height with an 80cm (31.5") inseam. Also, can a modern group set be a fitted to this frame? A: Rather difficult measuring stand-over height on a bare frame. Also, installing/removing wheels will mar the paint. A: A 54cm frame could work for you. But it's very much on the small end of the size range that may fit. Most info I have shows someone your size on a 56cm+ frame. Fit depends on your flexibility, how you ride, distances you ride, whether you're normally proportioned or have long or short legs for your height and what you're used to riding. Some people have ridden an incorrect frame size for so long they're at first uncomfortable on one that actually fits them correctly! Yes. 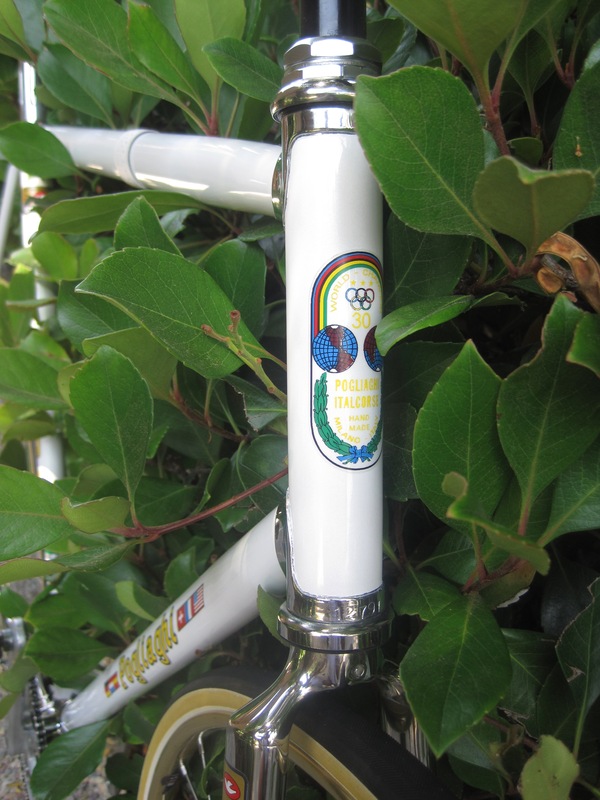 Modern components can be used with vintage frames. The Legnano is from the period before braze-ons were used, so cable clamps are necessary and brake calipers require exposed mounting nuts rather than recessed ones. Those are the only structural differences. Rear hub spacing is narrower (120mm) because the frame was built for a 5-speed hub. Most riders don't typically update a vintage frame of this era to 8-, 9-, or 10-speed (130mm) hubs. It can be done, but only using vintage components isn't necessary. 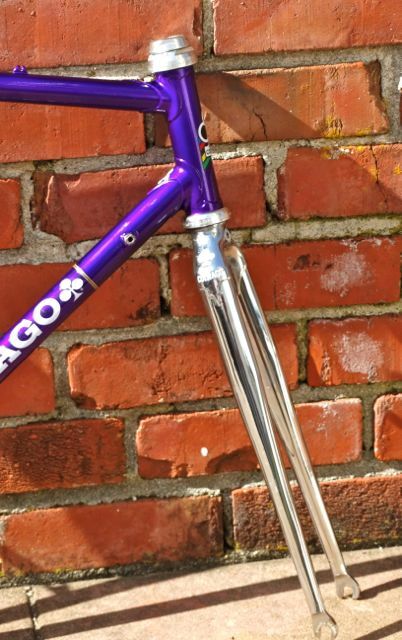 Q: Can full fenders be fitted to any of your frames? A: I've never attempted fitting fenders on any of the frames, so it's difficult knowing whether finders will fit a specific frame. Two tire clearance factors affecting fender fit are the brake calipers used and tire size. This varies significantly among frames of various designs and time periods. 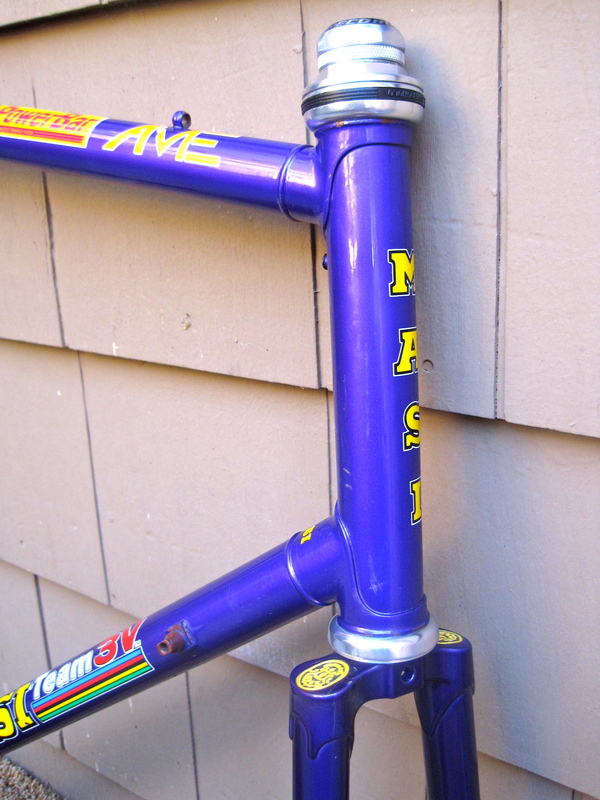 Older frames typically have much greater clearances than '80s and later ones. There appear to be several fender brands specifically made to fit racing bikes. Go to Western Bike Works' fender page and see the SKS Race Blade Long, Crud Catcher MK2 and Planet Bike EZ. I've not used these and cannot speak to their effectiveness, but they are made to meet the fenders-on-race-frames challenges.